This is a guest post from our partners at Turning Green, a global student-led movement devoted to cultivating a healthy, just and thriving planet through education and advocacy around environmentally sustainable and socially responsible choices. Our Footprint Calculator is Day 2 of their 30 day Project Green Challenge. What is my Ecological Footprint? How do I measure it? These questions were answered when I was introduced to Global Footprint Network’s Footprint Calculator. 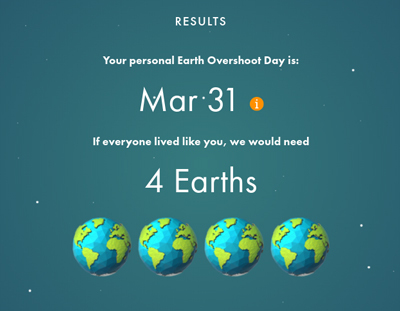 The Calculator illustrated how much nature I use by showing me the number of Earths we would need if everyone lived like me. It was an eye opening experience! I could not believe more than one Earth would be needed, let alone the four that were shown as my result. The Calculator helped me evaluate my lifestyle and discover how the choices I make impact the Earth. Where my family’s food comes from and where we buy it has the largest effect on my Ecological Footprint. Oftentimes, my family chooses to shop conveniently rather than buying local. The Calculator’s tangible solutions made me realize I could reduce my Footprint by encouraging my family to buy locally, whenever possible. We are now trying to switch from buying conventional meat to shopping at a local butcher and buy local dairy products, specifically milk. My goal is that we will reduce our meat consumption, which will lower our family’s Ecological Footprint. After using the Calculator and learning that energy was my second largest category, I knew I needed to make some changes. I never fully realized how much I depended on cars as a means of transportation. Now, I am inspired to walk, use public transit, and carpool more often. I plan to use these transportation options instead of driving, whenever possible. Especially in the warmer months, I would love to bicycle to my friends’ houses and to my recreational activities. I will also continue to carpool to my field hockey practices. Another significant aspect of my energy use is electricity. I plan to evaluate the light bulbs in my house and change them to LED bulbs. Switching to LEDs and limiting the amount I drive will reduce my energy usage. Global Footprint Network’s Footprint Calculator was easy to use and gave me simple, tangible solutions to reduce my Footprint on the Earth. After answering the questions on the Calculator and evaluating my results, I am committed to reducing the resources I use and making lifestyle changes to decrease my Footprint. This tool was an eye opener for me and I hope it can be the same for others. Now it is time to ask yourself…what is your Ecological Footprint? 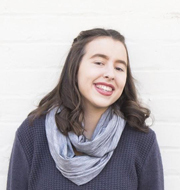 Bridget is a high school student in Alexandria, VA. She was a Project Green Challenge (PGC) 2017 Finalist, and is now serving on Turning Green’s PGC and Conscious College Road Tour Student Advisory Board Committees. Bridget was a founding member of the Watershed Warriors Initiative, a school club and now non-profit that educates elementary school students on environmental issues. She is involved in many activities at her school, including the Superintendent’s Student Leadership Committee, the varsity field hockey team, and the National English Honor Society (NEHS).